Spring in Alaska is fickle. 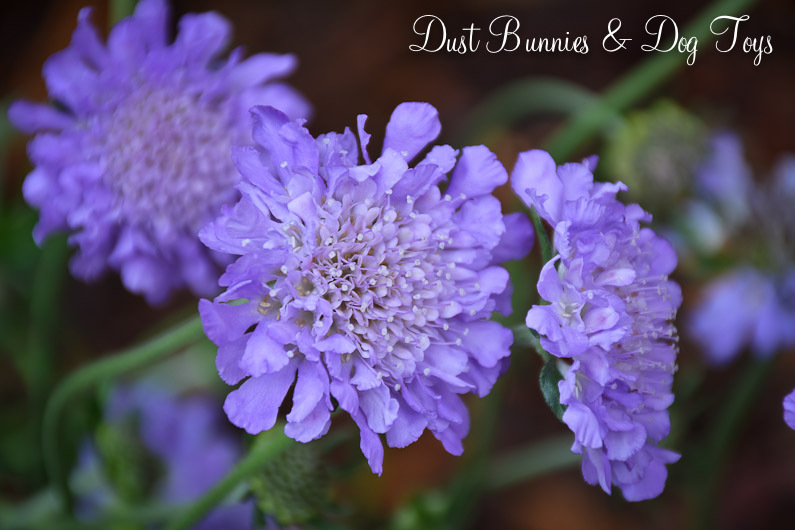 It’s been warmer than usual which has me thinking about planting, and then we had snow again yesterday! Apparently I’ll have to give it a bit more time, but I’m bound and determined that we are going to get the back yard set up this summer! 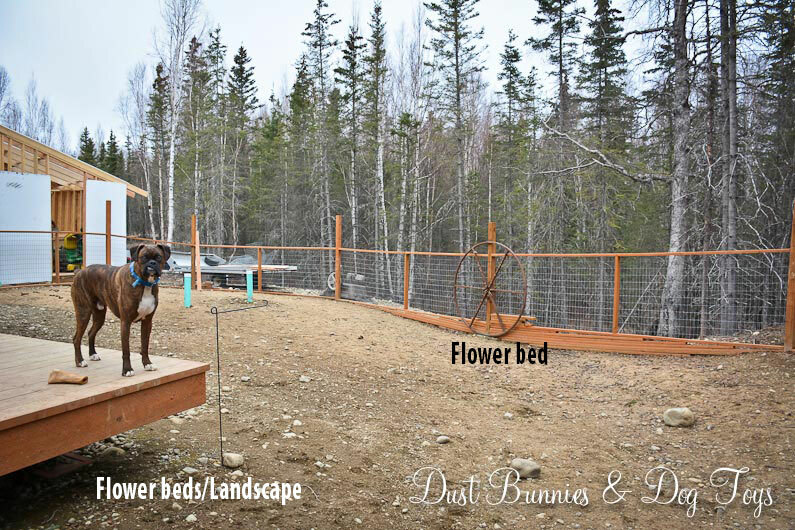 Last year, we were still getting settled and the priority was getting the fence in so the dogs would have room to run. We did get the yard hydroseeded late last summer, although I’m not sure how well it will come back this year after the dogs have been abusing it all winter. Hopefully the additional seed we put down last week will help get things going this season. In the meantime I’m fine tuning my vision for the entire space. It’s gone through a few revisions, as I talk things through with the hubs and watch exposure, but I think I’ve created a plan to get the basics established this summer so we can build on them each year. First up is the deck, which I cleaned last weekend to get the juices flowing. We pretty much ignored this space all winter while we focused on indoor projects, so I cleared the space and gave it a good sweeping. 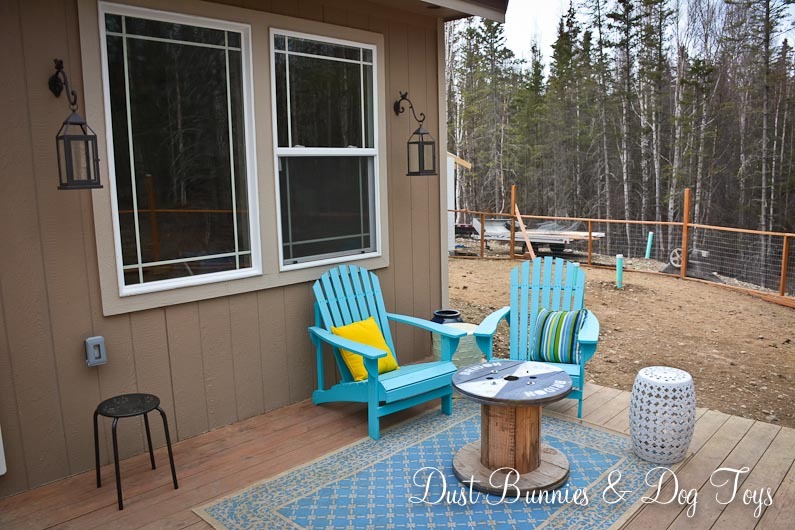 I dug out the outdoor rug I bought on the buy/sell page at the end of last summer for $10 and placed the Adirondack chairs and garden stools to create a seating area. I added the lovely lanterns on the hooks and a couple of throw pillows for a little style. It still needs a good pressure wash, but it’s a nice place to sit for a few minutes for now. Here’s a quick before and after. The plan starts with building a sectional seating unit like this with storage underneath where the cushions can be kept during the winter. I’m envisioning an L-shape along the wall and out from the corner made of a few pieces which could be rearranged for other set ups. I might also do a few ottoman pieces like this to store the propane bottles for the heater and fryer. A table like this would provide a spot to stash little things like candles and bug spray when not in use, but I might just leave the space open since I could also store such things inside the L shape during the season. 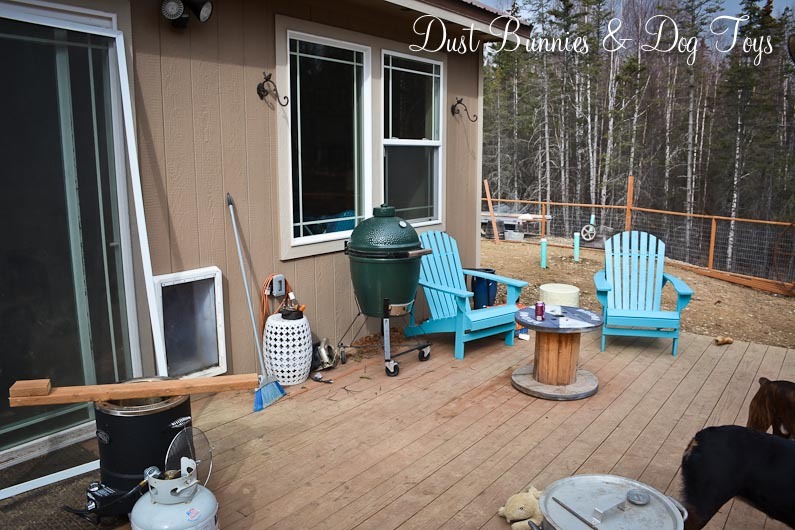 The hub’s green egg table will occupy the corner of the deck where the egg currently sits with our new oil-less fryer next to it. I’m excited to finally see the table all finished, set up and ready to use. The displaced Adirondack chairs will move to the firepit area that will be created along the edge of a pea gravel patio next to the deck. The pit itself will be created by stacking landscape stones around the freebie washing machine bin we snagged during construction. I love the idea of creating a cover that would make it also function as a table, especially with a little game board for fun! Behind that, underneath the family room windows we’ll install a raised garden bed made of cinderblock like this, but with removable tubs like this which can one day be transferred to and from the greenhouse I’ll have one day as the seasons shift. I’d like to try a hanging strawberry planter like this, so that might hang from the eave between the windows or over top of the raised bed or maybe I’ll try something like this on the back of the shed. The massive hot tub we scored on Craigslist has yet to be used because it’s just so huge and costly to run, so we’re passing it on to the family cabin down on the Kenai, where it should be much more utilized and appreciated during fishing season. We’ve got our eye on a few 2-person tubs and might invest in that later this year or next season. I’ve realized this alcove along the side of the house where I originally planned to do a full garden just doesn’t get enough sun to be productive, so instead we’ll put the chicken coop here. I’d like something similar to this which should have a small footprint next to the house. Locating them just off the deck will make taking care of the chickens easier and the house should provide extra radiant heat during the winter to keep them cozy. Beyond the coop I’m considering installing a potting bench with a simple design like this. I’m not convinced that I’ll use it enough to warrant the construction, so I might hold off on this idea until next year when I see how much need there really is. 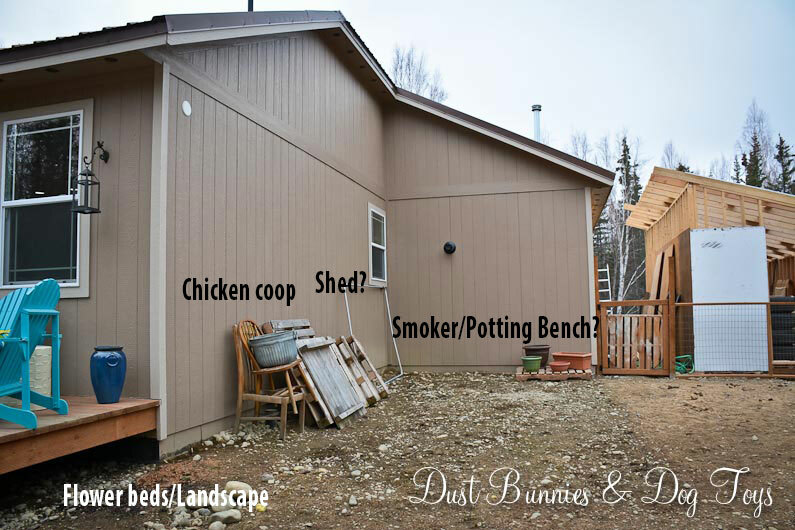 My other idea for the space is to build a smoke house – which I’m sure would get lots of use or a small tool shed to house things like rakes, shovels, etc. so they don’t take up space in the garage or the hub’s storage shed. If we go that route I could always add the potting bench or smoke house along the back wall of the garage, where I could see it from the laundry room. 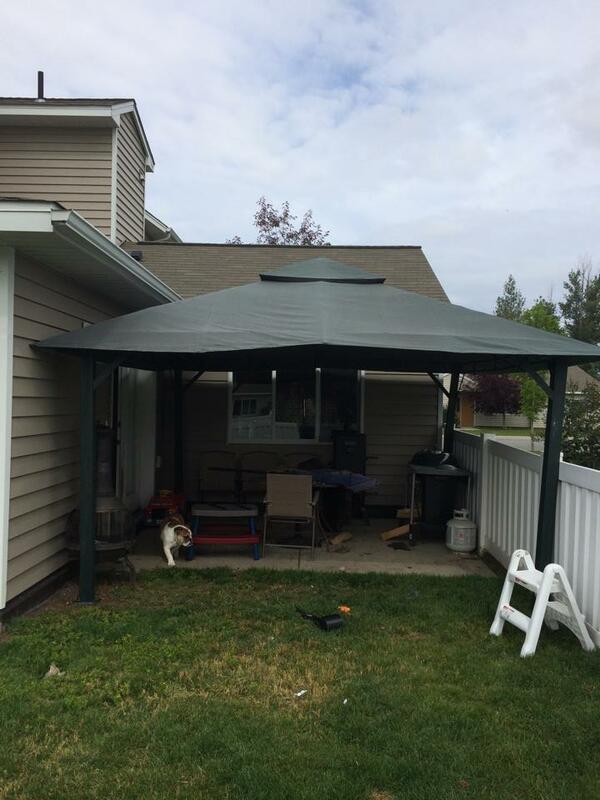 Although we bought a canvas gazebo canopy on the buy/sell page last year, I decided it wasn’t the right fit for the deck so we resold it. Eventually I want to add a pergola to the deck with some sort of shade cloth, but that might be a few years down the road still. In the interim I plan to create a simple shade like this by attaching poles to the sides of the deck with a few simple brackets. We may have to install an eye bolt on the back of the house to complete the set-up but it should be much easier to take down quickly if there are winds in the forecast. 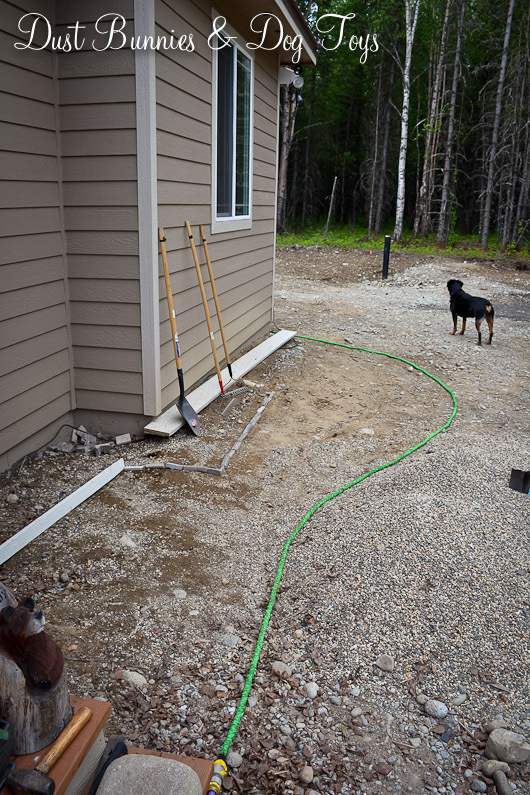 And no deck is complete without some sort of pest deterrent, especially in Alaska. Ours will come from the wine bottle tiki torches we had in Kodiak, but this time around rather than hang from a railing or post they will sit in holders like this around the perimeter of the deck. The poles for the bottles can be attached just like the shade poles mentioned above and I plan to fill the bottles half full with pebbles so they don’t require as much tiki fuel. 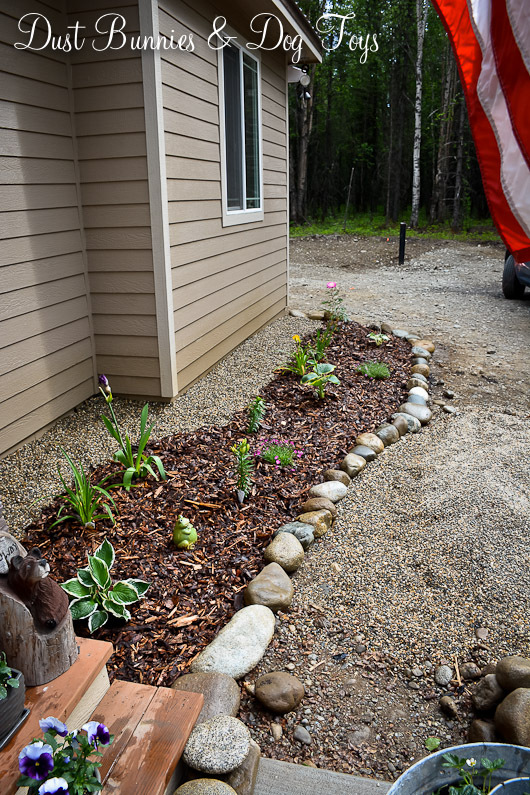 Finally, I’ll add some landscape around deck in the form of flower beds filled with perennials similar to the ones out front and along the far side of the house. I also plan to add a clematis in front of the big wheel the hubs found me, which is now tied to the fence near the deck. I may disguise the low area around it with a bit of a retaining wall to create a small bed in front of the wheel as well. We’ll see how far I get this year. 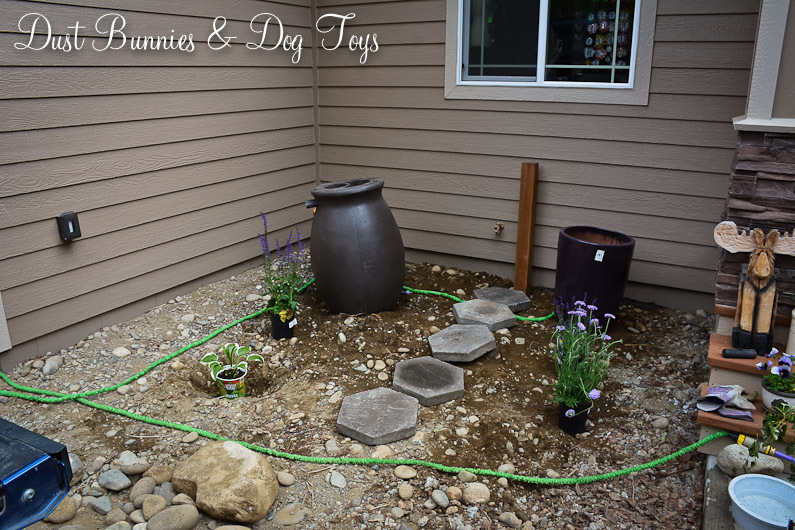 If I get all of this accomplished by fall and still have some decent weather to work with I may attempt to create a walkway like this from the patio to the back gate. So that’s the master plan. Watch for posts as we attempt each portion! Sorry for “going dark” recently, but we’ve been traveling the AlCan to Portland and back to visit family and bring home my prized 1955 F-100 pick-up. I’ll be posting about the trip soon, but for now I’ll get you caught up on a few projects I didn’t have time to share before our trip. The biggest was the installation of our first landscaping, two flowerbeds out front! After waiting weeks for the builder to grade our lot without resolution, the plants that had been sitting on my porch in anticipation were in desperate need of a permanent home. 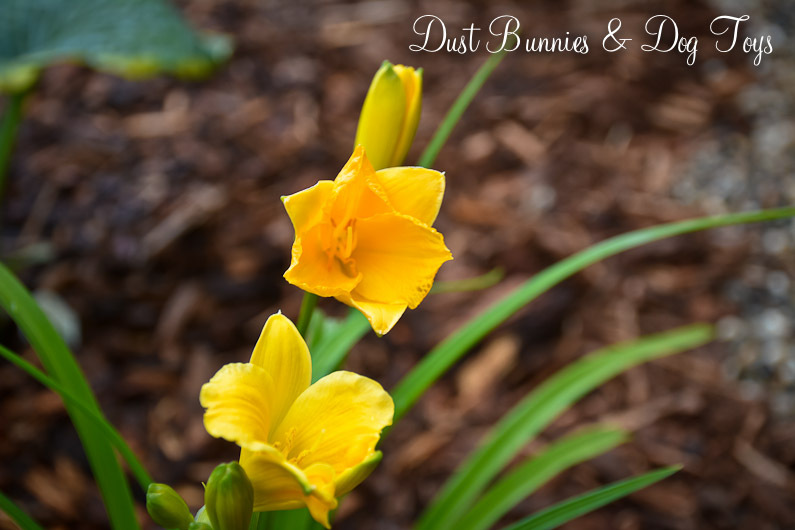 So we purchased top soil, mulch and weed fabric and set to work. I marked out the shape I wanted with the hose as a guide. Then the hubs helped me till and level the area. 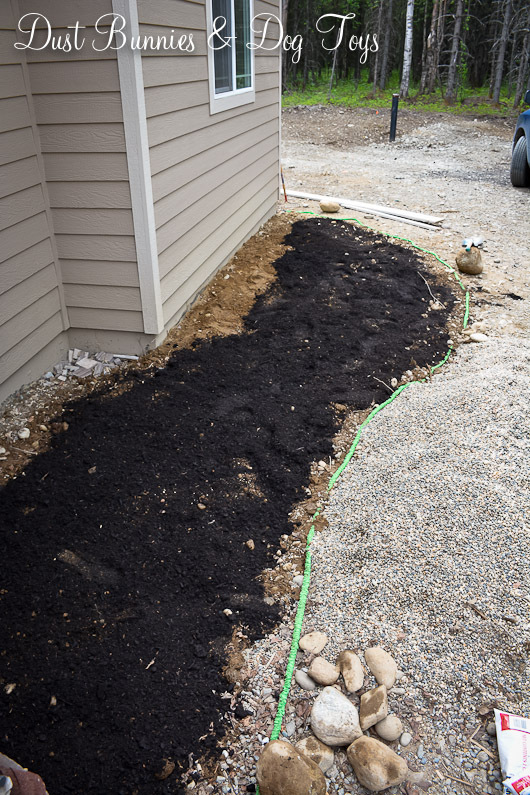 We added a layer of top soil on top of the tilled ground in the area where we planned to plant. 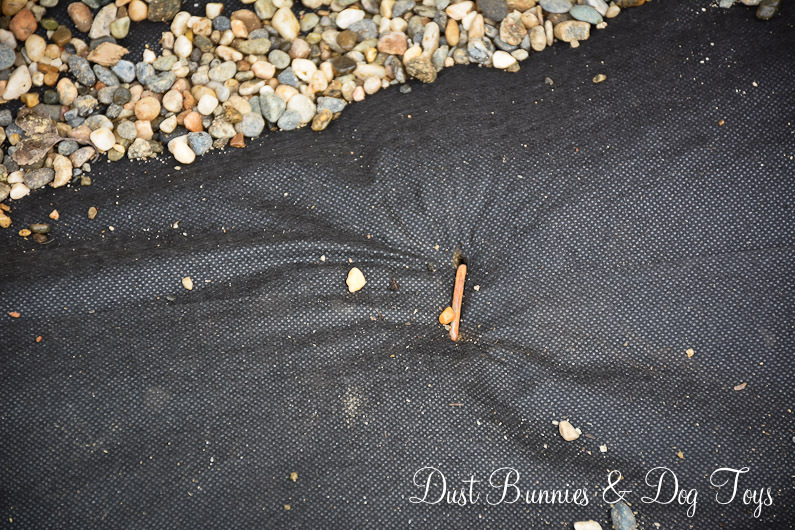 Next, we put down the weed fabric and used some large metal staples that came home in a bucket the hubs found for me as pins. 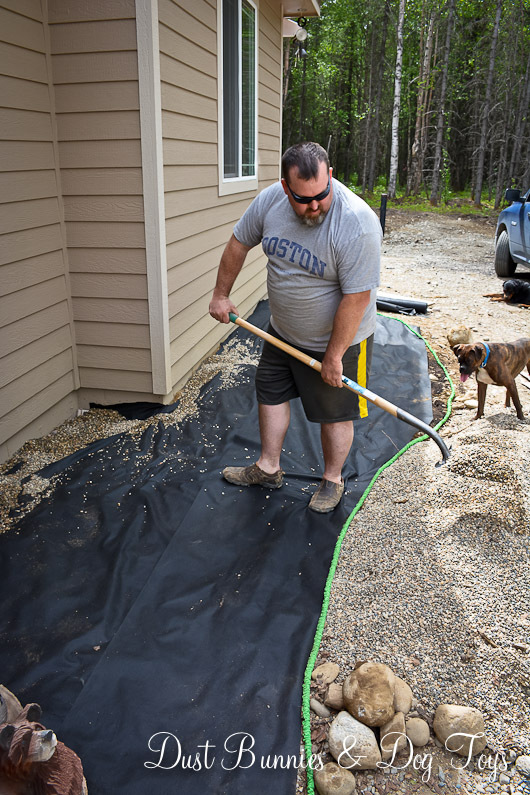 Then we put a section of pea gravel on top of the fabric along the house so when the rain water runs off the roof it doesn’t pool in the bed. 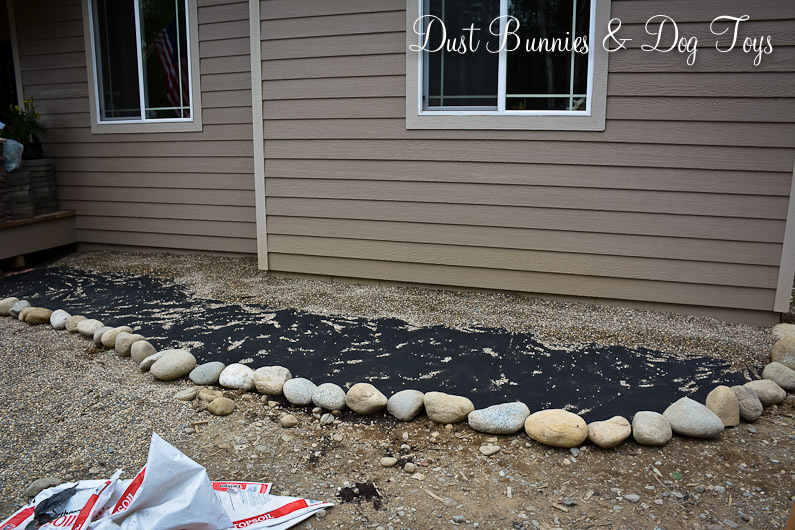 Luckily, the hubs was able to get a free supply of gravel that worked out to be just the right amount for this project! 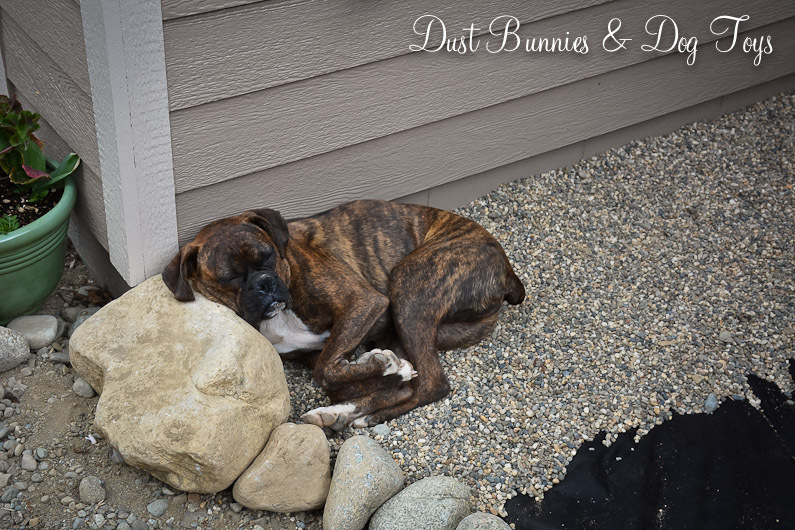 We also placed large rocks from around the yard along the border. After that, I laid out the plants to decide exactly where I wanted everything. It took a little rearranging to get everything just right, but it was fun trying out different groupings. Once I was happy with the layout, I cut holes in the weed fabric to plant each. 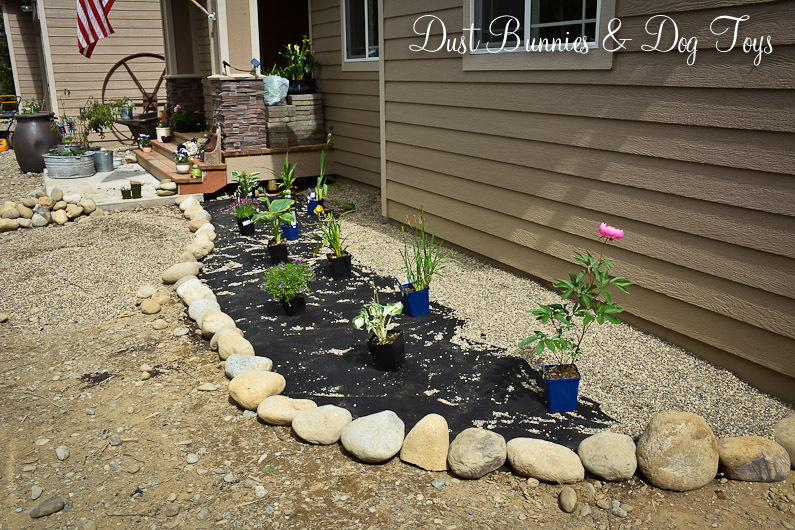 The hubs filled in mulch around each plant as I moved on to the next plant. 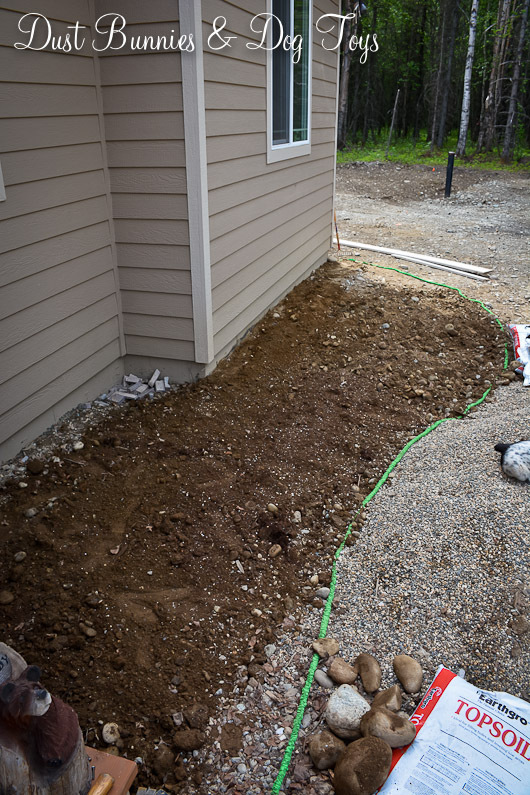 We also did a small bed between the porch and the garage, which included a walkway to the hose spigot on the wall. The pavers were a bargain find on a local buy/sell page for just $2/each, so we picked all we could and have a healthy stash for other projects. 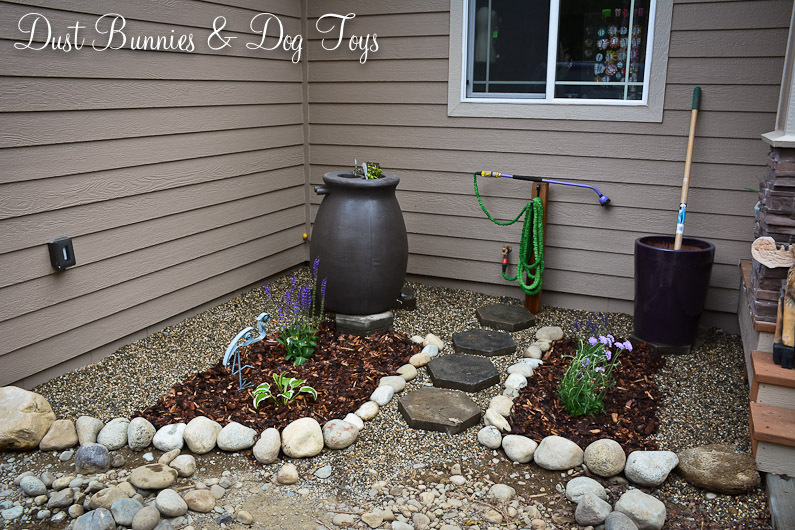 We followed the same process as the larger bed, but included spots for a rain barrel, hose rack and fountain. The rain barrel and fountain still need some work, but at least they are in place and prepped. Watch for posts about those and the hose holder soon. The entire process took about two days – much longer than I estimated, but it was well worth the effort and looks great! 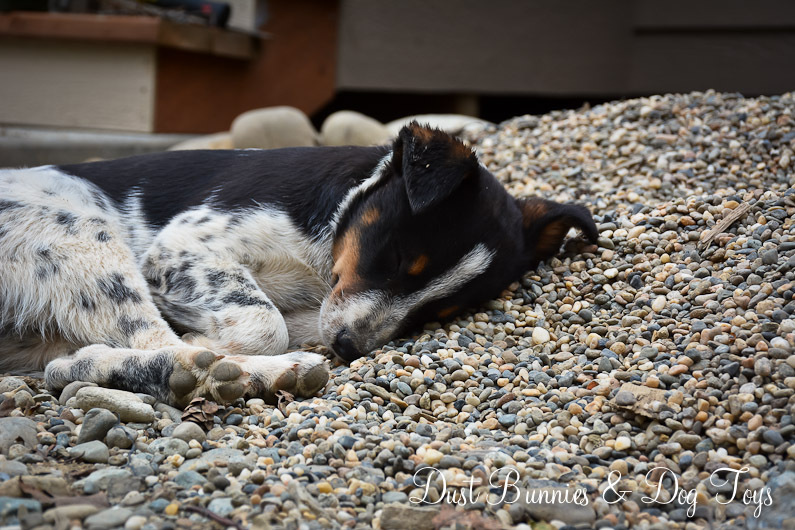 Although the kids played most of the time we were working, they did take a few breaks for naps on the pea gravel which they apparently found quite comfy. 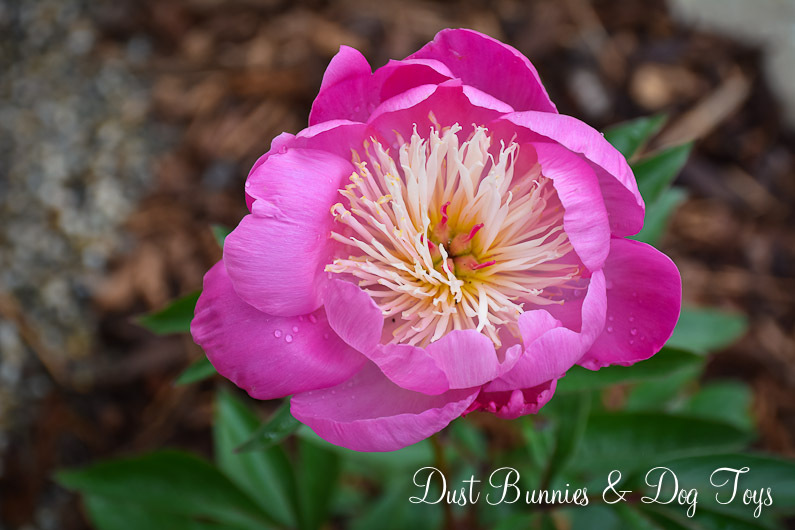 In retrospect, I probably should have skipped the weed fabric since everything we planted are perennials – hosta, iris, lilies, phlox, dianthus, peony, pincushion flower, lavender and salvia – which will spread with each season, requiring I cut a bigger opening to allow that process. I’ll leave it in place for now and see how it goes. 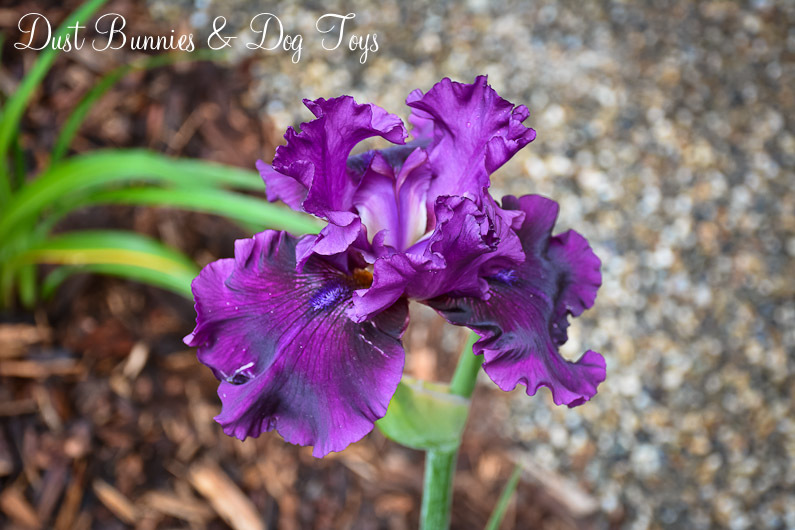 For now, I’m just giddy to have our first plants in the ground. Now I just need to get the rain garden, lawn and veggie garden going! Let the madness of planting begin! 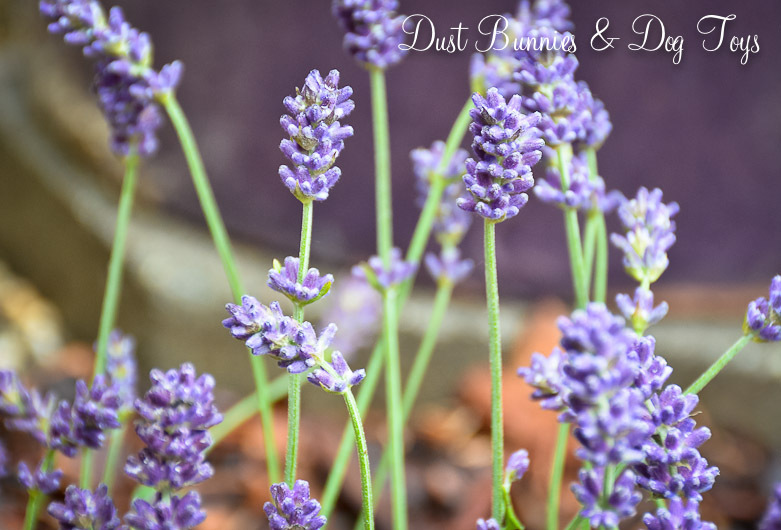 As I mentioned in my last post, I’m ready for warmer temps and the chance to get the yard landscaped. 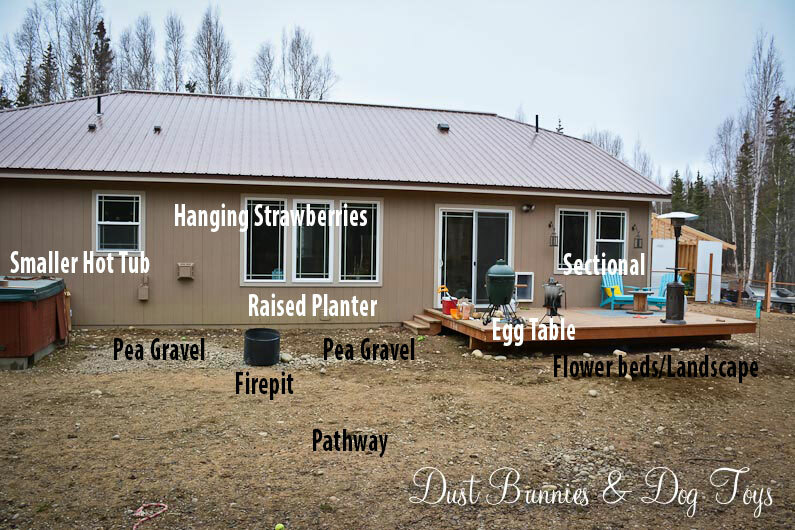 I’ve already shared my plans for the vegetable garden that will fill the alcove between the house and the garage and mentioned that we plan to add a deck off the Master to match the one off the Family Room, with a stone patio between for the hot tub and fire pit. 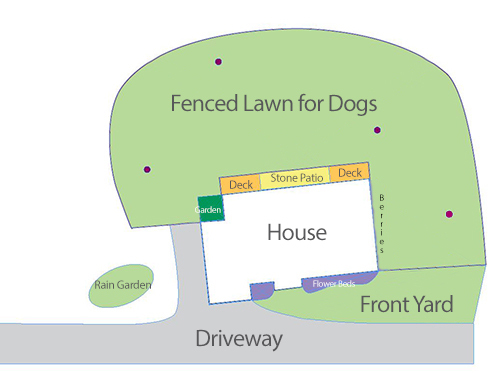 We also plan to fence in the cleared area behind the house and along the side, which will be hydroseeded to create a lawn for the dogs. We decided on using the hog panel fencing with a strand or two of electrified rope I have from an old horse pasture back home to keep what belongs in, in and what belongs out, out. I’m considering planting my berry bushes along the bedroom side of the house within this fence so they are protected from wildlife, but I might need to add a layer of protection from the dogs since Tequila has figured out how to pick her own berries and I’m sure it won’t be long before she teaches Stoli and Bacardi! I’m anticipating blueberries, raspberries and salmon berries if possible. My strawberries will be grown in the freebie barrel I picked up last summer. I also plan to install posts around the yard which will become mounting spots for Tequila’s favorite toy, the over-sized balls on a rope that Uncle Mark and Auntie Mere sent some time ago. This set up should prove much tougher than tying it to a tree branch, which only lasts a few minutes. I also want to use the posts of the fence to hold bird houses and feeders in strategic spots where we can see them from inside the house. I’m sure Luna will appreciate that. Our wine bottle tiki torches will return, although I’m not sure if they will be hung on the remaining fence posts or from the posts of the pergolas we’d like to have over the decks. The pergolas might not happen until next season, so I may start with some on the fence and add more once the deck covers are finished. Here’s my horribly simple rendering of the birds eye view of all this glory. It’s not exact, but you get the idea of what’s going where. 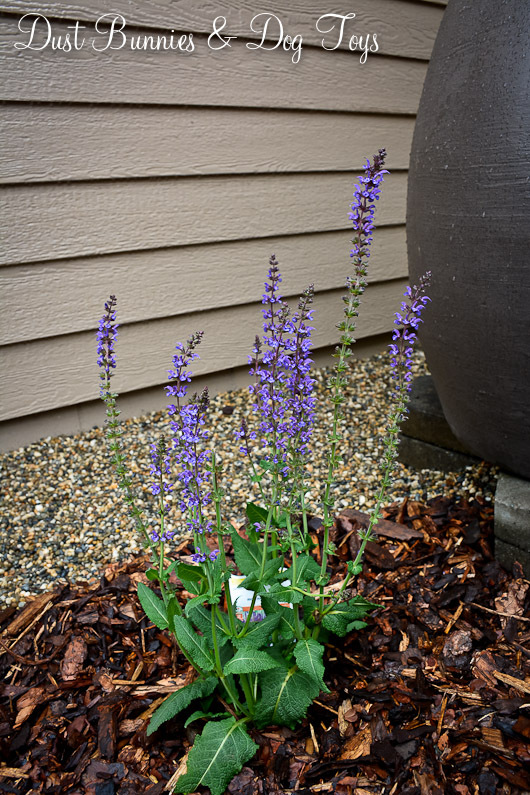 I anticipate there will be some trial and error with different plants in various locations, so feel free to make suggestions if you know of things that grow well in the Pacific Northwest, particularly Alaska!